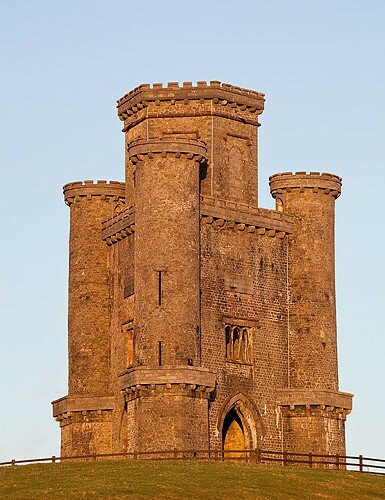 Paxton's Tower (National Trust) is a Neo-Gothic folly / an eye-catcher and banqueting hall / also known as The Nelson Monument / erected by William Paxton in 1806-1809 in honour of Admiral Lord Nelson - killed at the Battle of Trafalgar in 1805. It is a triangular building with a hexagonal castellated roof. On the ground there are three arches to accommodate carriages , with an upper apartment with stained glass windows showing Lord Nelson and scenes from his life. Its hilltop location provides Spectacular views over the Towy (Tywi) valley .